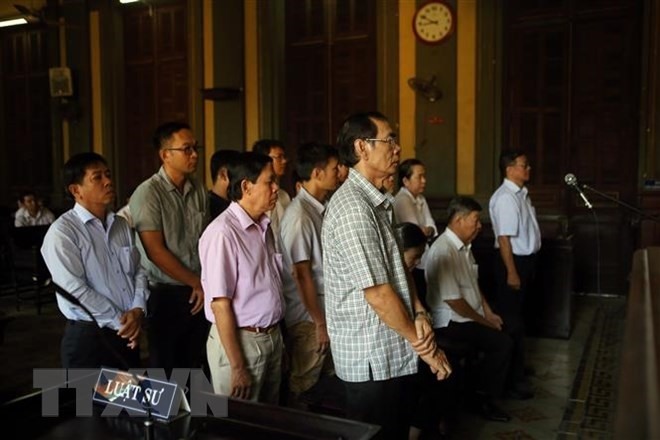 HCM CITY — On Thursday, the HCM City People’s Court sentenced Huỳnh Nam Dũng, former management board chairman of Mekong Housing Bank (MHB), to 13 years in prison for abusing power and causing losses to the State. Dũng’s accomplices, former MHB director general Nguyễn Phước Hòa and Mekong Housing Bank Securities Company (MHBS) former director general Lữ Thị Thanh Bình, were handed over 10 and 11 year sentences, respectively, also for abusing their power. Thirteen other defendants received three to six year prison sentences. Before merging with the Bank for Investment and Development of Việt Nam (BIDV), the MHS had charter capital of VNĐ3.369 trillion (US$149 million), with State capital making up 91.26 per cent. In December 2006, MHB established MHBS, with the bank contributing 60 per cent of the charter capital of the securities company. According to the indictment, between 2011 and 2014, Dũng and Hòa took advantage of their positions to transfer nearly VNĐ5 trillion (US$220 million) from MHB to MHBS for the stated purpose of investing in Government bonds. Instead of using the money as promised, MHBS deposited over VNĐ3.3 trillion ($145 million) into different branches of the bank to earn over VNĐ45 billion ($2 million) in interest payments. In addition, MHBS used more than VNĐ1.5 trillion ($66 million) to invest in bonds, of which nearly VNĐ1 trillion ($44 million) was used to trade MHB’s own bond investment via a middle company. This action resulted in a loss of nearly VNĐ349 billion ($15 million) to MHB. According to the investigation’s results, Dũng earned VNĐ460 million ($20 million) while other defendants also benefited to the tune of hundred of millions of Vietnamese đồng.